On one of Edmonton's hottest days of 2016 yet, thousands of sticky, booze-infused bodies crammed together into the Shaw Conference Centre to throw up their metal horns and celebrate the monumental return of Richmond, VA's thrash/metal-core titans Lamb of God. The evening kicked off on a rather low note, with Reed Mullin — drummer of Corrosion of Conformity — collapsing before the first opening act's set. But as the power of the metal Gods would have it, members of Clutch and Lamb of God banded together to ensure that the show would go on. Even despite the major setback of losing a key member right before the show, the remaining Corrosion guys and guest members powered impressively through a compressed set list before calling it a night. Second to conquer the stage were Maryland rock prodigies Clutch — one of the pioneering bands of their unique hybrid of psychedelic stoner rock and blues metal. The four-piece served up an exemplary set list of abrasive rural riffs, Molly Hatchet/Lynyrd Skynyrd-inspired classic rock themes and the unparalleled Southern-fried baritone vocals of frontman Neil Fallon. Highlights of Clutch's performance included "Noble Savage" and "Immortal," with audience engagement peaking during the latter. The band concluded their set on a fierce note with an excellent performance of "The Wolf Man Kindly Requests." Sweaty humans flocked to the beer gardens to fuel up and cool down during the final intermission before the headliners smashed their way to the stage. Watching the intricate stage prep for Lamb of God had audience members giddy with anticipation for whatever the genre-defying metal mammoths had in store for the night. Throughout recent years, the band have focused on upping the ante of their stage presence, incorporating more visual components such as video clips and plumes of smoke. 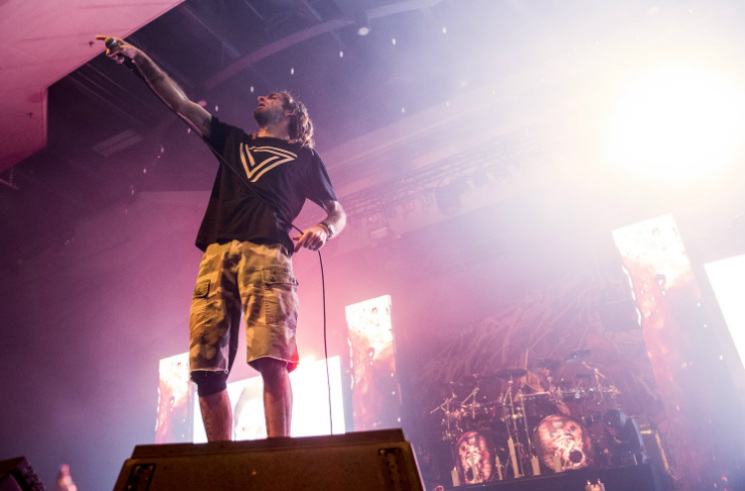 Comparing the energy and charisma that Lamb of God brought to the stage ten years ago to what they're boasting now presents a devastated land of difference, and they're currently producing some of the best live performances of their career. The band initiated their own unique method of carnage with an audience invitation to the dark side via a superlative rendition of "Walk With Me in Hell," then entered into true aural annihilation with "Ruin." Blythe's vicious vitality and extensive vocal prowess was — as it always is — a savage force to be reckoned with, easily placing him in the top tier of metalcore vocalists of his time. The pent-up anticipation of what was in store for Lamb of God's stage show paid off tenfold, as the digital backdrops boasted macabre montages of war crimes, disastrous devastation and clips of history's most notorious cult leaders and their devotees. While Lamb of God are always a band worth taking in, of particularly note this night was the harmony they maintained between earlier and newer tracks, off the most fan-favoured albums. While they failed to play some of their most well worshipped tunes, they still managed to bang out an eclectic array of songs spanning a major portion of their discography (save for 2005's Burn the Priest). The band reached the pinnacle of their performance with "Hourglass" and "Vigil," two very uniquely structured tracks that, in their own right, offered Lamb of God's signature level of angst and aggressive ambience. The night wrapped fittingly with Blythe's instruction for the audience to open up a sizeable savage circle pit as the band launched into "Redneck." To the audience's dismay, no encore was offered, but then the adrenaline charge of the night — combined with borderline heatstroke and sloppy inebriation — had attendees thirsty for fresh air, anyway.